Kevin Cassidy makes his way to the media tower in Healy Park. He is in demand, having already appeared on radio and TV, operating in two languages, before he speaks to the written press. Despite the miserable conditions in Omagh, none of the Gaoth Dobhair support on the pitch are inclined to start the near two-hour journey home. It was a milestone win for the club. For the previous seven years in Donegal, despite some extravagant talent, they hadn't got out of their group. But something clicked and momentum was gathered. Now they are kings of Ulster. It must have been extra special for Cassidy. He's 36 and his chances to win things are running out. There's an unspoken sweetness to his success. 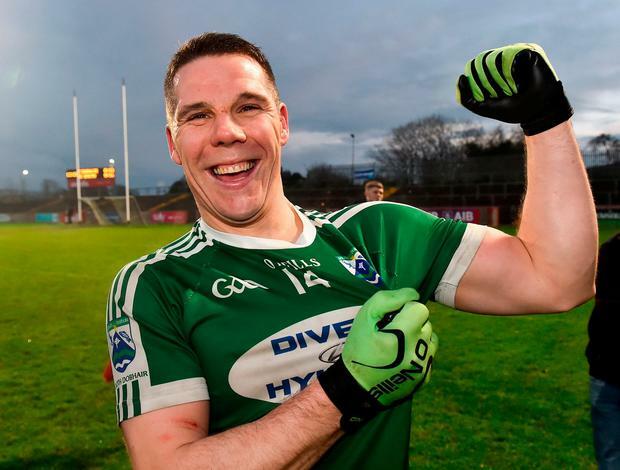 Having missed out on an All-Ireland medal so publicly in 2012 and being forced to look on as some of his club mates collected Sam Maguire, there was gold at the end of the rainbow for the two-time All-Star who has reinvented himself as a full-forward. "I think winning the county was massive for us but the last thing we did before we left Ballybofey was put the trophy in the middle of the room, we huddled around and said, 'listen, we've been there before in 2006 when we won it and drank ourselves silly, and we didn't prepare for Crossmaglen'," recalled Cassidy. "We were coming away with what-ifs. In that changing room, we said enjoy it, but get ready for Cargin (Antrim champions) and give a good account of ourselves. "Once we got over that, we were saying we're one step away from a final, and then you're there. "It's important not to leave these days behind you and not get into that mindset of thinking, 'they've been here, they're used to it'. It's a game, there's two sets of posts, 15 versus 15, and you have to have full belief in yourself. That's one thing those young lads don't lack." Their win over Cross' made everyone else sit up and take notice. "It was massive, for our older lads probably because we grew up looking at them. "These young lads, I don't know if they knew half these teams in Ulster. They're so laid-back, and that's why big days like this stand to them. "Coming into these big games I think it's the like of myself and Eamon and Neil (McGee) are a wee bit nervous because we know what's at stake. "These young lads just play, I've never seen the likes of them. It's great if you're able to do that, and it works for them." Perhaps Gaoth Dobhair's greatest asset is their ability to think on their feet. They were three down early in the second half and in the context of the game, it looked a steep hill to climb. They were two down with five minutes to play but they still found a way. Cassidy chipped in with two points. Eamon McGee made his name as an uncompromising defender but it was his quality on the ball that stood out in Omagh. Odhrán Mac Niallais was on the fringes of things for long periods but still delivered big moments. "(Playing full-forward) is easy when there's good players around you, they make fantastic runs and they play fantastic balls into you. "Obviously at my age, I'd love to be in the thick of it around the middle of the field but the legs aren't there. "Any way I can contribute to these lads and try and stay with them is great. I enjoyed today, we'll enjoy the next few days but Corofin are sitting waiting for us after Christmas." There's a little bit of down-time now before they take on the All-Ireland champions. It has been a long year but Gaoth Dobhair's old soldier will be ready to go again by the time the Galway men come into view. "Definitely, they're All-Ireland champions. We trained last Sunday morning and then the boys went home and watched them. "They are a fantastic team, without a doubt, they wouldn't be All-Ireland champions if they weren't. "That's the challenge, that's where you want to be and if you were to tell us back last January that we'd be one step away from lining out on Paddy's Day, we'd have taken the hand off you. "We're there now. To be honest, the bodies and minds are tired. It's been a long year, game after game, training after training, video after video. It takes a lot out of you. I think we're all looking forward to a wee bit of a break this week and next week. To be honest, I've never had a Christmas like it. It'll be nice preparing for another one."